Having a toy box can help organize the children’s play area and room. It can help reduce clutter and add an element of design to the room. This specific design will make a toy box that measures 3 feet in length, it will be 18 inches in length and 2 feet tall. The task can take several hours to complete. You will need some power tools. This will make the job go by faster and easier. You can even bring the children in to help finish the task. A nice toy box may be the incentive they need to put their toys away. Continue reading to find out more information on how to costruct a toy box. Prepare all of these parts with a ¾ inch plywood: 36 x 24 inch pieces for the front (two) and rear, one 36 x 16 1/2 inch as the lower part, two sides that measure 22 ½ x 16 1/2 inches and a top piece that measures 36 x 18 inches. Place the bottom portion flat. Place the front board against the lower piece and attach the two using 1 ½-inch screws (six). Repeat on the back side. Position all of the side ports into space in the center of the front and back pieces. Put 1 ½-inch screws (four) in the front, back and lower part to join each side. Place safety hinges (three) onto the lid. Put one hinge 3 inches from the other and the third one goes in the middle. Place the lid in the proper postion over the toy box. Cover the toy box at the real of the box three hinges. This will add security. Countersink any hole you made with wood putty. Allow the wood putty to dry completely. Sand the toy box all over to remove all rough edges. Also be sure make the putty as seamless and smooth as possible. Paint the exterior of the new toy box with some primer. Allow the primer to dry completely. You can use spray if you want a faster option. Now, put on a base coat over the toy box. Allow the base coat to completely dry. You can choose any color.Put on another coat of base coat if it is deemed necessary. Trace the child’s name onto the toy box very lightly with a pencil. 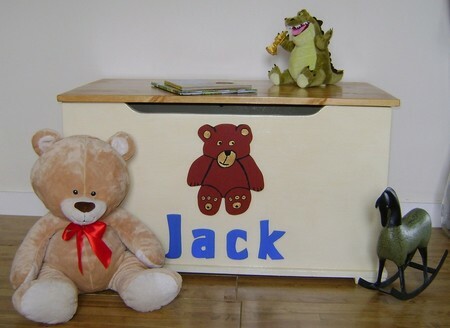 Then, you can let the child paint her or her own name onto their toy box. You can use stencils for easy decorating. You can get as creative as you want. Paint shapes, objects or even hand and footprints on the new toy box.